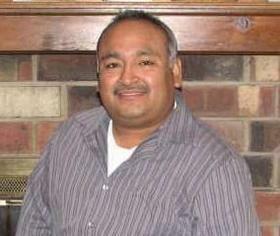 David Antonio Mares Jr., age 48, of Tulsa, OK, formerly of Holland, passed away Tuesday, August 28, 2018. Davie was born and raised in Holland and graduated from Holland High School in 1989. He took ministry studies through Faith Christian Center from 1998-2000 and graduated from Rhema Bible Training Center in 2004. When he lived in Holland, he worked in the lighting department at Menard’s. Davie was employed by Select Industries, where he was 2nd in charge of maintenance. He attended Rhema Bible Church in Broken Arrow, OK and attended Temple Jerusalem and Faith Christian Center in Holland. Davie’s two favorite passions, were, band and soccer. He was his sons’ favorite coach and biggest fan! Davie was preceded in death by his father, David Mares Sr. and two brothers, Victor Israel Mares and Victor Clemente Mares. Surviving is his wife, Michelle Mares; son, Jacob Mares and spouse Claudia Mares; granddaughter, Elaine Mares; step granddaughter, Sophie Proia; mother and stepfather, Elida Mares and Juan Nino; sisters and brother, Veronica and Sofia Mares, Amy Mares, and Jesus Mares; nephew, Jorge Torres; several uncles, aunts, and cousins; significant other, Michelle Gracia. Funeral services will be held 11 am Thursday (September 6) at Christ Memorial Church, 595 Graafschap Road. Burial will be in Pilgrim Home Cemetery. Visitation will be 7-9 pm Wednesday (September 5) at the Dykstra Funeral Home-Mulder Chapel, 188 West 32nd Street. Memorial contributions may be made to one’s choice.